Ideal for travelers short on time, this private 11-hour tour allows you to tick off all of Shanghai’s top sites in only one day. Visit The Bund (Waitan), the UNESCO-listed Confucius Temple, Yuyuan Garden, and the Shanghai Tower, the tallest building in China. Plus, enjoy a traditional Sichuan dinner while watching a face-changing opera show and take a dazzling evening cruise on the Huangpu River. Hotel pickup and drop-off in Shanghai are included. Your full-day tour begins at your Shanghai hotel at 11am, when you’ll board an air-conditioned vehicle and greet your private guide. Your first stop is Yuyuan Garden, a busy open space that manages to maintain its serenity with fish ponds and temples. Your next stop is Tianzifang, a renovated portion of Shanghai’s Former French Concession, to soak up the bohemian atmosphere and see the studios of writers and artists with a cold beer in hand. Then proceed to the Confucius Temple, a 1,000-year-old UNESCO World Heritage Site dedicated to the great Chinese thinker and philosopher. Following a tea ceremony inside the temple, you’ll satisfy your appetite with a traditional Chinese lunch. From there it's on to the observation deck of Shanghai Tower, the tallest building in China, you’ll enjoy panoramic vistas of the city after zooming to the top in the world’s fastest elevator. 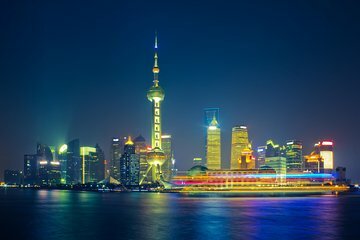 Wander around The Bund (Waitan) before boarding a boat for a 1-hour cruise on the Huangpu River, from which you’ll see Shanghai illuminated by night. Your tour culminates with a traditional Sichuan dinner while watching a face-changing opera. You’ll transferred to your hotel at around 10pm. Great tour with Jenny. Jenny is the most pleasant and professional tour guide during our 8 days in Shanghai. She spoiled us with great service that we just wished we had booked all other 8 tours with her. She was very attentive and made certain that my food allergies was not going to be a factor for us to worry about for lunch or dinner. I felt we were in extremely great hands with Jenny the entire time. Jenny professionally stopped local hackers from bothering us as we knew that was a very common thing in the markets and she just handled it gracefully. My husband and I enjoyed the private tour as it was incredibly informative and Jenny just made the tour so memorable and fun! And the lunch and dinner was delicious and yes, Jenny took care of my food allergy while accommodating my husband's craving for small juicy dumplings!! Great guide and great tour!